The Windows 8 user interface is designed for touching, tapping, pinching and swiping, but desktop touchscreen displays just haven’t gained the popularity that monitor makers had hoped for. At a time when you can buy a very good 23-inch non-touch monitor for less than $300, NEC’s MultiSync E232WMT doesn’t make a strong enough case that you should spend twice as much for a model that supports 10-point touch. The MultiSync E232WMT has an interesting dual-hinged stand that easily collapses into a flat position. This renders its touchscreen more comfortable to use than when it’s vertical. 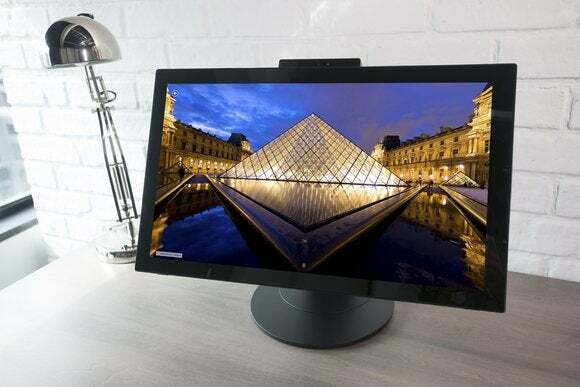 The stand connects to the display by way of a standard 100x100mm VESA mount, which means you can replace it with most any third-party mount (such as an articulated arm). The MultiSync E232WMT's double hinge allows it to be adjusted to almost any angle, including flat as a tabletop. The E232WMT connects to your PC via HDMI, DVI, or VGA, but it does not support DisplayPort. The high-quality AH-IPS screen has native resolution of 1920x1080 pixels, and mercury-free LED backlighting. 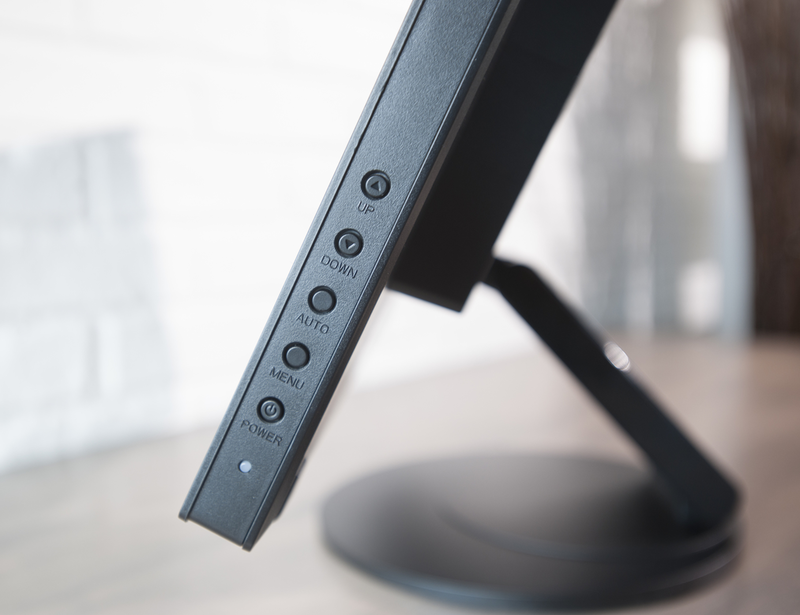 Niceties include a built-in webcam with a stereo microphone for video conferencing, a 4-port USB 3.0 hub, a headphone jack, and a pair of internal 1W speakers. As you might imagine, the speakers sound pretty thin, but they’re good enough for system alerts and such. No extra software is needed to use the E232WMT’s 10-point touch features with Windows 7 and later. Mac users are out of luck. I used the NEC with Windows 8.1 and found the display’s touchscreen to be responsive when tapping, using gestures, and typing with the onscreen keyboard. NEC's engineers wisely placed the control buttons on the side of the bezel, where they're less likely to be pressed unintentionally. The IPS panel provides a wide angle of view. I saw no shift in color or loss of contrast when moving my head to the left or right from the center of the display. Text was clear and legible, even at small point sizes. Photos looked good, with accurate colors, lots of detail, and smooth skin tones. The only issue I had with the display was the glare from its very glossy screen. Our offices, like many business environments, have overhead lighting. When I moved the display into a flatter position to use the touchscreen, the glare was very strong. If you need a touchscreen for your desktop, NEC’s MultiSync E232WMT should be on your list to consider. Its high-quality screen, responsive touch capabilities, and flexible stand render it a strong—albeit expensive—contender. 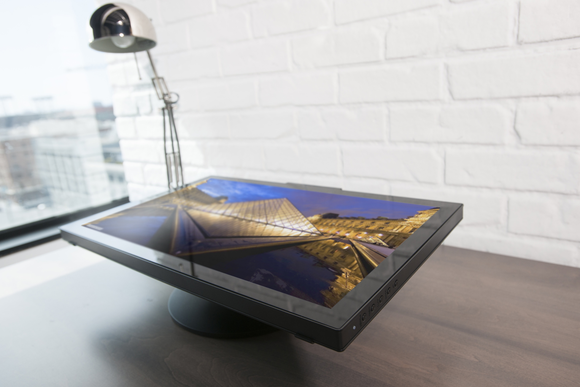 The NEC E232WMT is a high-quality multitouch monitor with a very flexible stand. It’s a strong candidate for bringing the touchscreen experience of a tablet to your desktop.